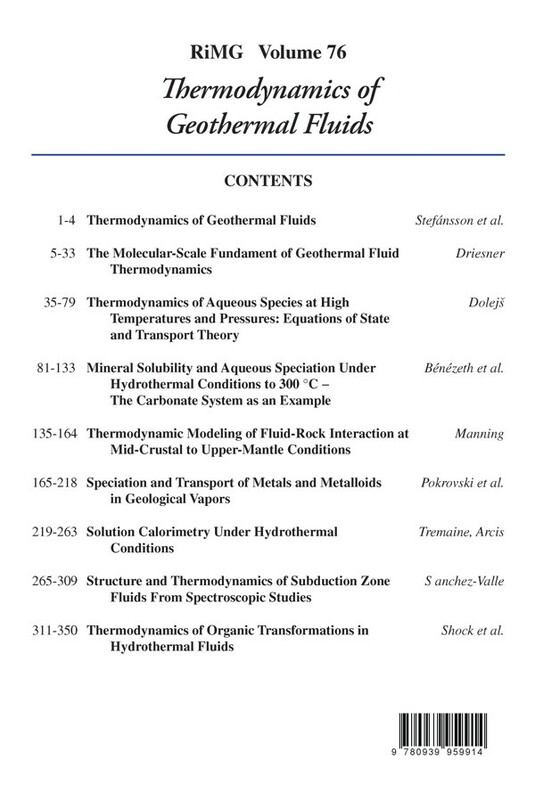 This volume presents an extended review of the topics conveyed in a short course on Geothermal Fluid Thermodynamics held prior to the 23rd Annual V.M. Goldschmidt Conference in Florence, Italy (August 24-25, 2013). Geothermal fluids in the broadest sense span large variations in composition and cover wide ranges of temperature and pressure. Their composition may also be dynamic and change in space and time on both short and long time scales. In addition, physiochemical properties of fluids such as density, viscosity, compressibility and heat capacity determine the transfer of heat and mass by geothermal systems, whereas, in turn, the physical properties of the fluids are affected by their chemical properties. Quantitative models of the transient spatial and temporal evolution of geochemical fluid processes are, therefore, very demanding with respect to the accuracy and broad range of applicability of thermodynamic databases and thermodynamic models (or equations of state) that describe the various datasets as a function of temperature, pressure, and composition. The application of thermodynamic calculations is, therefore, a central part of geochemical studies of very diverse processes ranging from the aqueous geochemistry of near surface geothermal features including chemosynthesis and thermal biological activity, through the utilization of crustal reservoirs for CO2 sequestration and engineered geothermal systems to the formation of magmatic-hydrothermal ore deposits and, even deeper, to the de-volatilization of subducted oceanic crust and the transfer of subduction fluids and trace elements into the mantle wedge. Application of thermodynamics to understand geothermal fluid chemistry and transport requires essentially three parts: first, equations of state to describe the physiochemical system; second, a geochemical model involving minerals and fluid species; and, third, values for various thermodynamic parameters from which the thermodynamic and chemical model can be derived. The two biggest current hurdles for comprehensive geochemical modeling of geothermal systems are that thermodynamic data for species in fluids are often missing, particularly at high temperatures and pressures, and that none of the existing equations of state for aqueous solutes and chemical reaction thermodynamics is valid over the whole range of temperatures, pressures and compositions encountered in Earth’s crust and upper mantle. Moreover, it is well recognized that inconsistencies in and between existing thermodynamic databases and theoretical formulations or equations of state that provide thermodynamic data such as equilibrium constants and activity or fugacity coefficients can result in major differences and uncertainties in geochemical modeling. Another current problem is that the temperature-pressure ranges for which thermodynamic data on fluid species can be considered accurate (typically below 300° to 350° C) often do not overlap with the ranges for which accurate thermodynamic properties of rock-forming minerals such as feldspars, micas, clays, aluminosilicates and iron-magnesium bearing phases such as chlorite or epidote are available. Frequently, modeling of fluid-rock equilibria therefore relies on standard state thermodynamic data for minerals that are extrapolated downwards from high-temperature phase equilibria, solubility and calorimetric studies (e.g., Holland and Powell 2011) and the uncertainty of the extrapolation is often unknown. As the variations of thermodynamic mineral data with temperature and pressure are rather well-behaved, it can be expected that future attempts for deriving internally consistent thermodynamic data sets may reduce this problem by constraining the extrapolations with fluid-rock reaction data at lower temperatures. On the other hand, extrapolating thermodynamic properties of aqueous species to higher temperatures and pressures is often error-prone as extrapolations have to go through regions with rapidly changing bulk fluid properties (such as density, heat capacity, and compressibility near the critical point of water) or may suffer from changes in aqueous speciation along the extrapolation path that cannot be predicted a priori. Recent approaches to correlate solute thermodynamic properties with relevant properties of water may be the most promising route to overcome this unsatisfactory situation. The drawback of methods that determine Gibbs free energies of reactions is that many thermodynamic properties of interest (such as enthalpy, entropy, heat capacity and volume) are derivatives of the measurements with respect to temperature and pressure rather than being directly determined. To derive them requires interpolation between experimental data points, which makes the derived property values sensitive to finding an adequate mathematical formulation for interpolation. Furthermore, the derivation of thermodynamic properties of the individual species from the thermodynamic properties of the reaction often involves the choice of conventions or even extra-thermodynamic assumptions about the physics of the measurement (e.g., a model of ion mobility in conductivity measurements, or a model of the scattering processes in an X-ray absorption experiment). The most popular model and thermodynamic database used among geochemist over the past two to three decades has been the Helgeson-Kirkham-Flowers (HKF) equation of state and the Supcrt92 database (Helgeson et al. 1981; Tanger and Helgeson 1988; Shock and Helgeson 1988; Johnson et al. 1992; Shock et al. 1992) and the density model (Anderson et al. 1991). However, these models do not work over a large range of temperatures, pressures and compositions that are encountered by different types of geothermal fluids, for example, supercritical fluids that exsolve into high-density saline brines and low-density vapor, high-pressure fluids associated with subduction zones, high-enthalpy and low-pressure fluids like superheated vapor and volcanic gas, to name just a few (Manning 2004; Yardley 2005; Audétat et al. 2008). In recent years, considerable progress has been made with thermodynamic models for aqueous solutions and solutes that can be used over a wide range of temperatures, pressures and compositions and over liquid-vapor phase changes that are based on electrostatic, macroscopic volumetric and microscopic statistical-mechanical approaches (see Palmer et al. 2004). Moreover, linking aqueous solute thermodynamics to the properties of water is also expected to be the key route for accessing the supercritical region that has been known as notoriously much insight into the thermodynamics of supercritical fluids has been obtained and a number of rigorous relationships have been derived. Molecular simulation approaches and statistical mechanics have provided theoretical frameworks that link the molecular scale processes in fluids to macroscopic thermodynamic properties, a subject that is discussed in the second chapter of this volume by Thomas Driesner (Driesner et al. 2013, this volume). These advances go along with the advent of synchrotron radiation sources that allow the direct study of aqueous speciation from ambient to extreme conditions (e.g., chapter 8; Sanches-Valle 2013, this volume). The accumulating insights into the molecular scale of geothermal fluids over very wide ranges of conditions, together with theoretical advances, will likely form the basis for novel equations of state (EoS) that can cover the currently inaccessible conditions mentioned above. 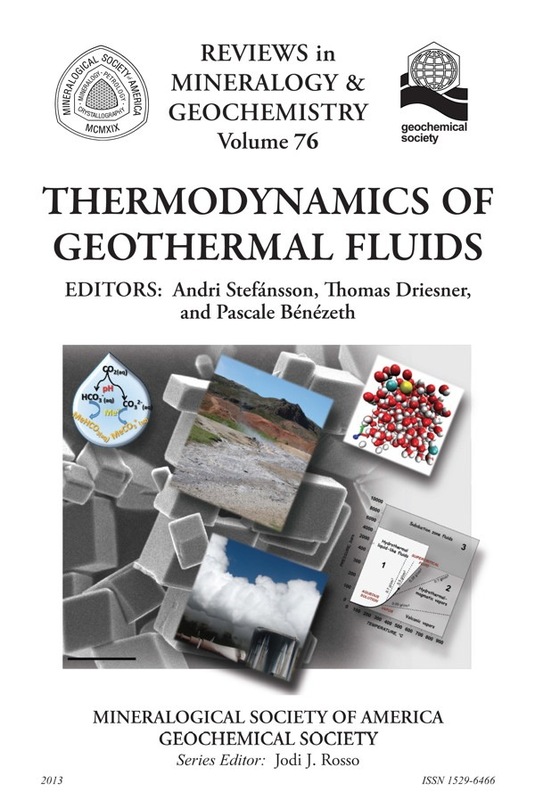 Indeed, the need for equations of state over a wide range of compositions, temperatures and pressures describing both bulk fluid properties and thermodynamic properties of solutes for comprehensive geochemical modeling of geothermal systems is shown by the review in the third chapter by David Dolejš, who gives insights into basic thermodynamic models, EoS and transport theory by reviewing the thermodynamics of aqueous solutes at high temperature and pressure (Dolejš 2013, this volume). Most of our basic thermodynamic parameters come from experimental work on well-defined chemical systems, which allow control of the governing parameters such as temperature, pressure, pH, ionic strength, or redox state with sufficient accuracy. As discussed in more detail in the fourth chapter by Pascale Bénézeth and others, such experiments are often very difficult to carry out at high temperatures and pressures and require laborious efforts (Bénézeth et al. 2013; this volume). A common method is to study mineral solubility as a function of fluid composition, which allows simultaneous determination of the Gibbs free energy of fluid-mineral reactions and inferring the aqueous species that participate in the reactions. Other popular methods for speciation studies are potentiometry and conductivity measurements, as well as various spectroscopic methods. The example of the carbonate systems is used in chapter four to demonstrate the lack of data and the misuse of inconsistent sets of thermodynamic data to model fluid-rock interaction up to hydrothermal conditions. Recent data acquired by using a combination of various experimental tools are compared with previous data and discussed. In the fifth chapter of this volume, the thermodynamics of fluid-rock interaction continues to be described and discussed by Craig Manning for deeper geological systems at higher pressures and temperatures, from mid-crustal to upper-mantle conditions (Manning 2013, this volume). For instance the predicted and measured solubility of some minerals (corundum, calcite) obtained at high temperature and pressures are compared to demonstrate that some agreement can be obtained via the density-based approach. Vapor-phase transport capacities for metals and metalloids are the motivation of the review given by Gleb Pokrovski and others in the sixth chapter (Pokrovski et al. 2013, this volume). They review recent experimental data and models of the speciation of metals and metalloids and the solubility of their solid phases at conditions spanning from low-density volcanic gases to supercritical fluids and compared them with field observations. Calorimetric and volumetric (density) measurements, for example, may directly provide fundamental thermodynamic values of the properties that are derivatives of the Gibbs free energy. As most equations of state for the thermodynamic properties of aqueous solutes at elevated temperatures and pressures involve these properties (and derive free energies by integrating them) such experimental data are an invaluable basis for the accurate parameterization of thermodynamic models. Errors that result from integrating derivative properties are normally considered less significant than errors on derivative properties that result from an improper interpolation of free energy data. In chapter seven, Peter Tremaine and Hugues Arcis provide a review of the history and application of solution calorimetry for hydrothermal systems (Tremaine and Arcis 2013, this volume). More recently, direct determination of the stoichiometry and abundance of aqueous species has become available with X-ray absorption spectroscopy methods using synchrotron radiation. In chapter eight, Carmen Sanchez-Valle reviews recent progress on spectroscopic studies (Raman and XAS) combined with diamond anvil cells at pressure-temperature conditions relevant to subduction zones, discussing in particular the effect of chloride and dissolved silicates on the mobilization and transport of high field-strength elements (HFSE) and rare earth elements (REE) (Sanchez-Valle 2013, this volume). Finally, Chapter nine by Everett Shock and others gives an overview of the thermodynamics of organic transformations in hydrothermal conditions, combining natural observations, thermodynamic models and experimental data (Shock et al. 2013, this volume).